The refreshing, pine-like aroma of rosemary blended with brisk, crisp China green tea & a touch of sun-kissed citrus are chock-full of healthy goodness. But it's the deliciousness ~ hot or chilled ~ you'll never forget! 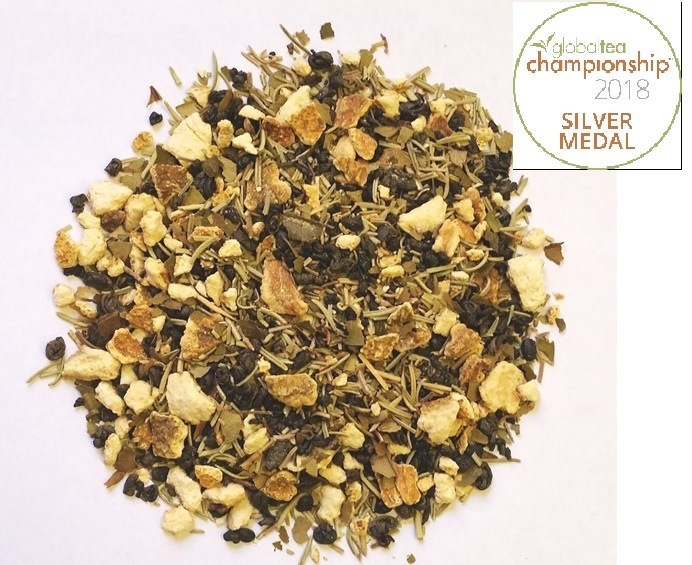 Remember Rosemary was awarded a Silver Medal in the Global Tea Championships Blended Green Tea Category (2018). Ingredients: Chinese Green Tea (Organic), Lemon Myrtle (Organic), Orange Peel (Organic), Rosemary (Organic) 1 oz. SAMPLES MAKES 10 CUPS Steeping Instructions: 1.Fill kettle with fresh water, then heat. 2. Heat water below boiling (approx 195°). Steep 1 teaspoon NOTE: Vary time according to taste, & remember that steeping tea leave beyond 5 mins will give you a bitter taste ***This information is for educational purposes. This information has not been evaluated by the Food and Drug Administration and is not intended to diagnose, treat, cure or prevent any disease.